The number of evacuees coming to Okinawa from Fukushima Prefecture is still growing despite eight months having passed since the Great East Japan Earthquake. According to the Prefectural Disaster Prevention and Crisis Management Division, an average of 50 people per month have taken refuge in Okinawa from Fukushima since this June, when they began to compile statistical data on the number of evacuees by prefecture. Yasushi Ohama, a deputy councilor and a member of the Prefectural Acceptance Team, analyzed the data and said, “Many evacuees from Fukushima came from locations more than 30 kilometers from the nuclear power plants. There is significant anxiety about the levels of radioactivity.” We can tell that the scope of anxiety related to the radioactive pollution from the accident at the Fukushima No.1 Nuclear Power Plant is now expanding. 804 people, including those who left on their own volition, are known to have evacuated to Okinawa, with the majority, 529 of them, coming from Fukushima. 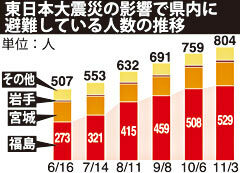 The number of evacuees from Fukushima as of June 16 was 273 people, so the total has increased by 256 since then. “Until April or May the majority of the evacuees were from Miyagi Prefecture – people whose homes had been affected by the tsunami, but after temporary housing was constructed most of the people then came from Fukushima,” said Deputy Councilor Yasushi Ohama.